We served from 1994 to 2003 in the city of Cáceres (pronounced: "Cather-es" ) located southwest of Madrid (300 Km. or 200 miles) and about 15 Km. south of the Tajo river. Spain and Portugal together form the Iberian peninsula--the most western extension of the European continent-- separated from Africa by only the narrow Strait of Gibraltar. 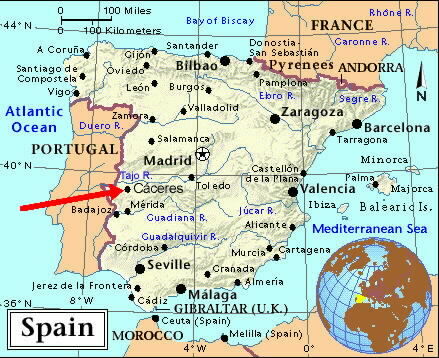 Spain is a mountainous country, which contrary to the popular belief that Spain as a "flat plain". This false stereotype may have been fabricated by the line, "The rain in Spain falls mainly on the plain" in the musical My Fair Lady. In fact Spain is the second most mountainous European country, second only to Switzerland and more mountainous than Austria were we lived before coming to Spain. Orellana - discovered and named the Amazon river. Cáceres has been named the 2nd Best preserved Medieval city in Europe by UNESCO. Mérida in 25 BC was the Roman Capital of the whole Iberian Peninsula then known as Roman colony of Lusitania. Extremadura was the birthplace of the two most famous Spanish Bible translators Reina and Valera. Today the Reina Valera Bible is the most popular Spanish translation in the world. 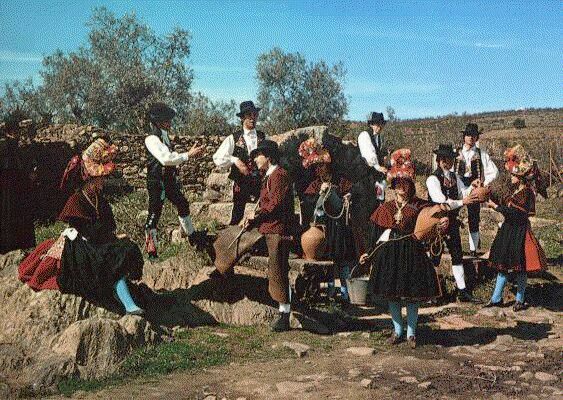 The colorful hats of Montehermosa (Cáceres) are the most popular traditional Extremaduran costume.